The EasyCopy Graphics Suite has no limitations and is your perfect companion when standard presentation tools fails. 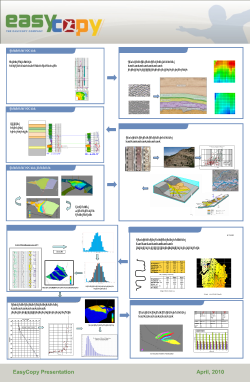 Support for CGM, CGM+, CGM PIP, EMF, EMZ, GIF, JPEG, JPEG 2000, PDF, PNG, PPT, PS, SVG, TIFF... files generated with all major G&G applications other applications used in the within Geo Science. Unlimited canvas size or set page from first image for either creating a Montage or presentation or edit and annotate a single image/graphic. Stitch PDF, when logs have been saved as multipage PDF for easy archiving, but not for printing. Save as layout - is a small xml based file with reference to your existing files with NO extra copies filling up your system - It includes auto backup and can be used as template, to update previous work etc. Print/Plot with no limitations to any device. By using the unique "adapted page size" there is no need to struggle with custom page sizes anymore. Paneling allows you to print 1:1 even when your paper size is smaller than the file size. The Movie Creator tool will allow you to create an animated sequence of screen capture, cgm, emf files and/or any other supported format. It includes a frame viewer that makes it easy to edit, move, delete, copy frames when ever it is needed.